Anywhere it rains, it can flood. Protect your investment in your home by purchasing flood insurance, even if you do not live in a high-risk flood zone. Elevate your home’s lowest floor above the Base Flood Elevation (BFE). Elevating can lower flood insurance premiums and reduce the risk from increased future flood levels. Elevate or floodproof HVAC and/or mechanical units, ductwork, electrical systems, and other utilities above the BFE to protect against flood damage and reduce repair costs. Install flood vents in foundation walls, garages, and other enclosed areas. Flood vents reduce flood damage by allowing water to flow through and drain out. Use flood-resistant materials in areas of your home below the BFE, like replacing carpeting with tiles or using flood-resistant insulation and gypsum wallboard (Sheetrock), to prevent water from doing major damage. Anchor any fuel tanks to the floor and make sure vents and fill line openings are above the BFE (this may require permission from your fuel provider). A fuel tank can tip over or float in a flood, spilling fuel and becoming a fire hazard. Install a backflow valve on your sewer system to prevent sewage back up in your home. Add waterproof veneer to exterior walls to prevent shallow flooding from damaging your home. Seal your basement walls with waterproofing compounds. FEMA P-312, Homeowner’s Guide to Retrofitting 3rd Edition (2014): FEMA has prepared this guide specifically for homeowners who want to know how to protect their homes from flooding. As a homeowner, you need clear information about the options available to you and straightforward guidance that will help you make decisions. This guide gives you both, in a form designed for readers who have little or no experience with flood protection methods or building construction techniques. 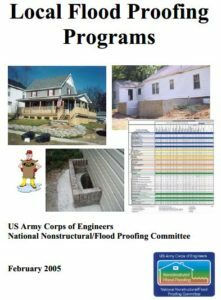 Floodproofing Non-Residential Structures (Full Document), FEMA 102: This document provides technical information for building owners, designers and contractors on wet and dry floodproofing techniques. The purpose of this Recovery Advisory is to provide guidance on the design of dry floodproofing measures to reduce flood damage and limit interruption of building services. This advisory incorporates observations made by the FEMA Mitigation Assessment Teams (MATs) in Texas and Florida after Hurricanes Harvey and Irma. It describes best design practices and successful implementation of dry floodproofing, as well as lessons learned from failures. The information in this advisory is directed toward existing and new non-residential facilities. Download the Dry Floodproofing – Planning and Design Considerations. 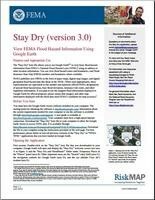 The “Stay Dry” utility allows you to use Google Earth (TM) to view basic flood hazard information from FEMA’s National Flood Hazard Layer (NFHL) for a community or an address. You can view flood hazard zones, cross sections and labels, community names and boundaries, Flood Insurance Rate Map (FIRM) numbers and boundaries, and Letter of Map Revision (LOMR) case numbers and boundaries. To use the application, you must have Google Earth installed on your computer, a high-speed Internet connection, and the Stay Dry kmz file. The kmz file is available through FEMA’s Map Service Center at http://msc.fema.gov. The FEMA Building Science Branch is pleased to announce the release of the second edition of Protecting Building Utilities from Flood Damage, FEMA P-348. The overall objective of this updated publication is to assist in the repair, reconstruction and new construction of buildings with building utility systems and equipment that are designed and built for maximum flood resiliency. The updated publication illustrates design and construction of utility systems that comply with the NFIP requirements for new or Substantially Improved residential and non-residential structures in flood-prone areas. It is also useful when evaluating structures for utility system upgrades or replacement, guiding users to meet floodplain management regulations and building code requirements. Even if NFIP compliance is not required, many building owners may find that applying the mitigation measures described in this publication will not only reduce future flood damage, but also facilitate faster recovery after flooding. Tools to assist the building owner in determining the best mitigation option for a particular building type and condition. To download a copy of FEMA P-348 go to https://www.fema.gov/media-library/assets/documents/3729. The residences are existing buildings. This publication is not intended to address construction of new buildings in floodprone areas as these structures should be sufficiently elevated and built in conformance with NFIP and local floodplain management regulations. The residences are not Substantially Damaged or Substantially Improved, meaning that the buildings have not sustained damage or undergone improvement (i.e., reconstruction, rehabilitation, addition) where the cost of the damage or improvement exceeds 50 percent of the market value of the building before the damage occurred or improvement began. As with new construction, Substantially Damaged or Substantially Improved structures must be re-built in conformance with NFIP and local floodplain management regulations. Link to the publication Reducing Flood Risk to Residential Buildings That Cannot Be Elevated. 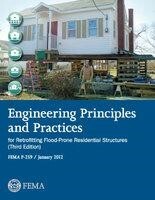 The third edition of Engineering Principles and Practices is intended to further aid homeowners in selecting and successfully executing a flood retrofit on their home. Engineering design and economic guidance on what constitutes feasible and cost-effective retrofitting measures for flood-prone residential and non-residential structures are presented. Elevation, relocation, dry floodproofing, wet floodproofing, and the use of levees and floodwalls to mitigate flood hazards are discussed. This edition was updated to be more user-friendly and concise, the overall length of the publication has been shortened. Subdivision Design and Flood Hazard Areas was prepared by the American Planning Association (APA) in partnership with the Association of State Floodplain Managers (ASFPM), and it was supported through a cooperative agreement with FEMA. This report demonstrates the intersection of sustainability, resilience, and climate change in light of changing flood hazards and how these concepts play out in subdivision design. This purpose of this report is end the cycle of build-damage-rebuild, and provide communities with sound guidance to bring subdivision design into line with the best of floodplain planning. The report includes many best practices as well as six planning and design principles; standards for review, inspection, and maintenance; and nine recommendations to keep subdivisions safe from flooding. There is a great article in the American Surveyor titled “Taking the Mystery Out of Flood Openings” by ASFPM’s Region 4 Regional Director, Terri L. Turner, AICP, CFM. Surveyors and local floodplain officials will appreciate this useful resource that illustrates some important considerations when evaluating flood openings. Click TheAmericanSurveyor_Turner-FloodOpenings_Vol10No6 for the article. Have questions, contact us at kentuckymitigation@gmail.com. Don’t forget to join the KAMM group on LinkedIn.